In most construction projects—big or small—grinding is an essential part of the process. These machines shave small sections of your workpiece until you’re left with a high-quality product. Although every grinding machine uses the same basic process, there are different types of machines for different kinds of material. Finding the right grinder for your project might feel confusing, but it doesn’t need to be. We’re here to help you find the best grinder to suit your needs. Grinding machines, or grinders, actually describe an entire category of different machines. The material that you’re trying to grind down will determine what’s the best grinder for you. Keep in mind that, anybody who uses a grinder should be trained beforehand. Guidelines by OSHA outline the specific safety precautions you should follow when operating a grinder. If you’re trying to grind down metal, a versatile belt grinder might be just what you need. These grinders can be aggressively fast, which make them the perfect tool to use on hard, metal surfaces. The belt, covered in abrasive material, can run over the surface you’re trying to grind and remove unwanted segments or material. Most belt grinders will allow you to adjust the speed of the coated belt to your liking. After you’re finished with the belt grinder, it’s important that the machine is stored on a flat, rigid surface that won’t get damp or frosty. Machinists are required to manually operate bench grinders. These large machines usually have two different wheels with different grain sizes situated on a workbench or floor stand. You can use a bench grinder to perform rougher, grinding operations like shaping or repairing tool bits. Generally, bench grinders aren’t optimal for highly-intricate or complex work. Also known as a side grinder, an angle grinder operates on a right-angle fixed on top of an abrasive disc or cut-off disc. Most of the time, these machines are used to remove unwanted material from a workpiece. The type of disc on your angle grinder can play a large role in which tasks it’s suitable for. You can find these grinders in almost any workshop or auto body repair shop. Even Emergency Rescue crews often keep an angle grinder on board in case they need to cut someone out of a perilous situation. Cylindrical grinders get their name from the shape they work best on: cylinders. If you need to shape the outside of an object, you can use a cylindrical grinder to do so. These devices will shape anything from a crankshaft to an ellipse—just as long as your object has a central axis of rotation. They also do well with high-precision work. If your workpiece needs a complex shape, a cylindrical grinder might be perfect for the job. Whenever you’re working with complex machinery and materials, you always want to closely follow safety precautions to protect yourself and others from harm. Grinders are no exception to this rule: unless you’re adhering to safety guidelines and wearing the proper gear, you could seriously injure yourself. Any grinding machine—regardless of how often you use it—should be regularly checked for damage. The abrasive wheel can cause significant harm if it becomes damaged. Cracked or broken wheels can even explode, so you should always examine your abrasive wheel (also called a “ring test”) closely before usage. Beyond the wheels, it’s always a good idea to thoroughly check the rest of your machine too. Regardless of whether or not you believe your grinder is in top-notch condition, examining your machine before using it could save your life. The maximum speed of your wheel (RPM) is usually marked on the abrasive wheel. If you exceed this speed while you’re working, it could become dangerous. OSHA recommends that you take monthly readings of your grinder speed, and always take several readings of any new machine that you operate. When you’re grinding, it’s important to wear safety goggles or a face shield to protect your eyes and face from flying particles. The tiniest metal fragment could permanently damage your vision. Depending on the machine and material you’re working with, safety gloves, metatarsal boots, and a respiratory mask may also be required. If you’re only using a grinder for personal use and not at the workplace, you might not consider your environment. Unfortunately, attempting to operate a grinder in unsafe environments could end in serious injury. Be sure that, wherever you’re at, there’s an appropriate ventilation exhaust system so that you don’t end up inhaling large amounts of dust or debris. A respiratory mask can also help prevent this. Keeping your work environment dry and clean is another good idea. Not only can wet floors cause you to slip while working, but you never want to store your grinder in a damp place. Anybody—even trained co-workers—should keep a safe distance while you’re operating the grinder, especially if they’re not wearing protective equipment. Whether you’re looking to shave off a little metal or perform highly-intricate work, finding the best grinder for your needs can be overwhelming. We’re here to ease the confusion: these are some of our favorite grinders on the market today. 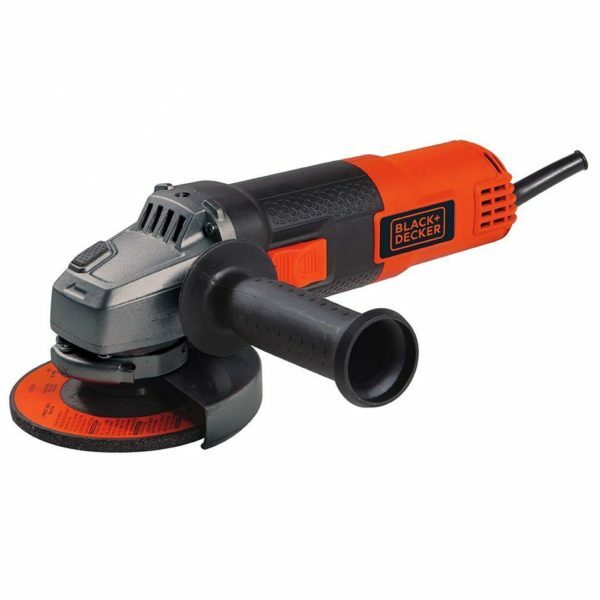 Operating at a maximum speed of 10,000 rpm and 6 amps, this angle grinder is a light and quick choice. The entire machine only weighs a little over 4 pounds and is 4 1/2 inches–minus the length of the handle. Although it might not be the perfect fit for extremely large surfaces, this grinder’s small size makes it a portable option. As long as you have an outlet in your workspace, you can transport the angle grinder to any location you need. The 3-position handle allows you more control while you’re working. On the handles, the padded grips provide you with a little bit more comfort and a better grasp. On the side of the machine, you’ll notice that there’s a release switch that will allow you to rapidly shut off the grinder if you need to. The included spindle lock is designed to easily switch out accessories. This angle grinder is electrically-powered so it will need to be plugged in at a nearby outlet to work. It also comes with a metal gear case for storage, which may improve its durability and lifespan. 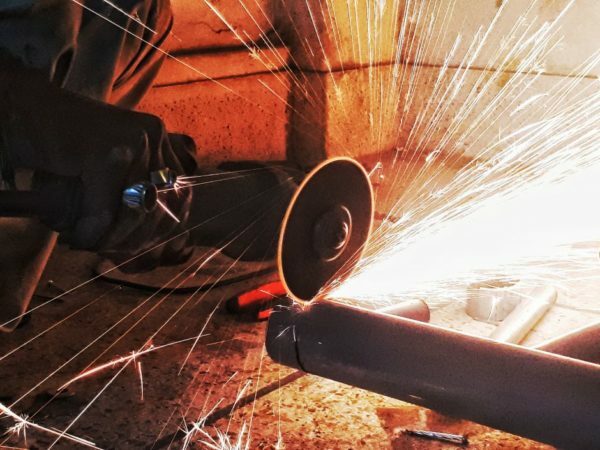 For projects that include cutting, removing rust, grinding, or surface preparation, this angle grinder may work better than others. The WEN bench grinder is slightly bigger with 6-inch by 3/4-inch wheels and runs with a 2.1-amp motor. In comparison to the 4-pound angle grinder, this 16-pound bench grinder might seem heavy, but it’s actually designed to be lightweight. However, while it may be portable, the sturdy base ensures it won’t be going anywhere while you’re trying to work. 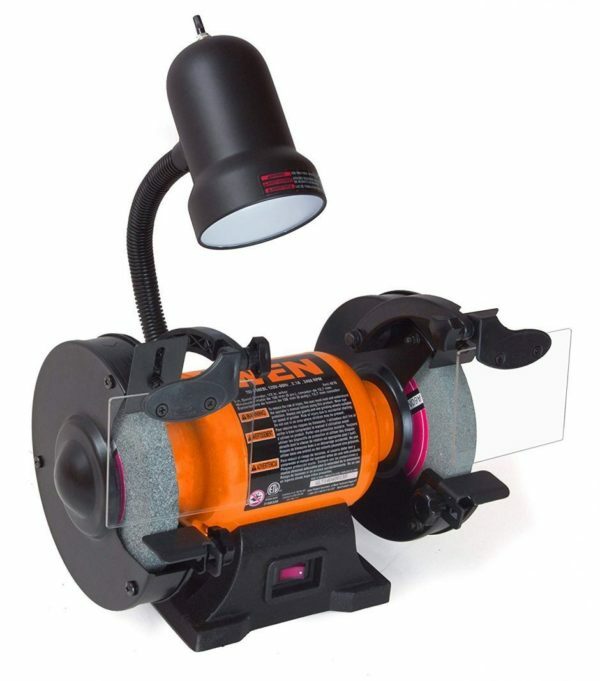 There is a flexible work light attached to provide extra visibility while you grind. If you’re used to working in darker conditions or under poor lighting, you might find this feature particularly useful. With a maximum speed of 3,450 rpm, this bench grinder operates at a standard pace. You might not be working at a lightning-quick pace, but you also won’t be lagging behind either. 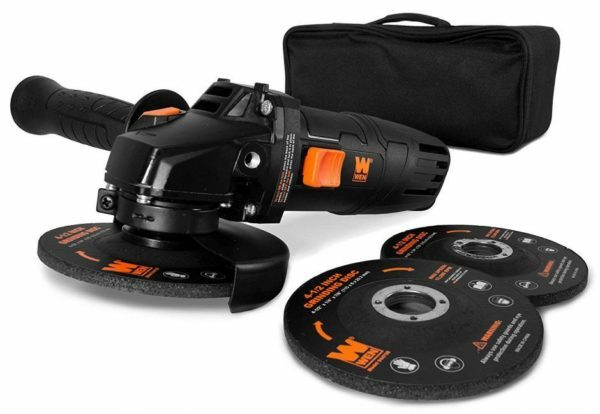 The WEN bench grinder is designed for easy wheel changes. The guard is easily removable so that you can quickly switch out a worn or damaged wheel for a new one. When purchasing this grinder, look carefully at what’s provided: the standard option only includes the grinder, but you can also buy the wheel and stand if you want. Regardless of which option you choose, the manufacturer includes a 2-year warranty with your purchase. Also made by WEN, this angle grinder runs on a 7.5-amp motor, and has a maximum speed of 11,000 rpm. The higher motor and speed may make this a better option when you’re trying to grind through tough materials like chains and pipes. The arbor adaptor ensures that this machine is compatible with both 5/8 and 7/8-inch grinding wheels. The reversible auxiliary handle will attach to either side of the grinder. This feature makes the machine easily-accessible to anyone—regardless of what side you may be working on. On the grinder, you’ll also find a lock-on side switch that snaps into place. This convenient feature means you won’t have to constantly keep your thumb pressed down on the trigger. Purchasing this grinder also comes with a few accessories, including three grinding wheels, the reversible handle, and a compact carrying case. Not only does the carrying case make the angle grinder more portable, but it may also prevent external damage or rust. At only 4 pounds, this grinder is designed to be lightweight. It has an electric power source, so you’ll need to plug it in when you’re working and keep the cord a safe distance from the grinder and wheels. 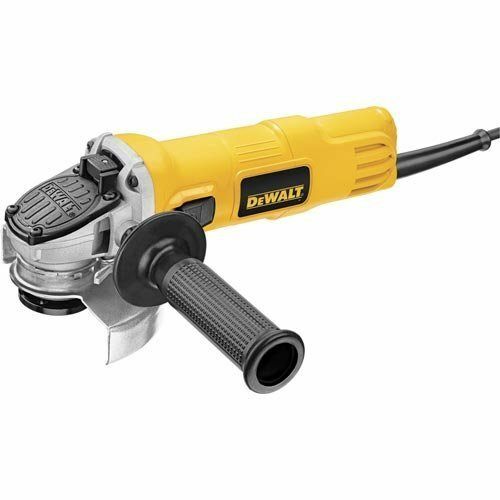 The DeWalt Angle grinder runs on a 7-amp motor, and a high maximum speed of 12,000 rpm. If you’re trying to cut through rough materials quickly, this might be the perfect grinder for you. While higher speeds can sometimes make grinders prone to overheating, this machine is designed with extra overload protection. Instead of a traditional spanner wrench, it comes with a hex wrench. If you happen to lose the included hex wrench, this tool is typically found in most toolboxes. Unlike other competitors, you won’t need any special tools to change the location of your guard. The one-touch guard can be adjusted by simply turning it. Speaking of tool-free features, you won’t need a wrench to change the wheel either. The side handle is removable and includes two-positions for added comfort and better control. If you prefer angle grinders with slim, portable designs, you’ll probably like this one: the jam-pot gear case increases the durability of the machine, but also allows it to fit into tight spaces. In your workspace, you’ll likely find that this product takes up less space than bulkier angle grinders. While it does not come with any specific warranty, the manufacturer may replace broken or damaged parts. 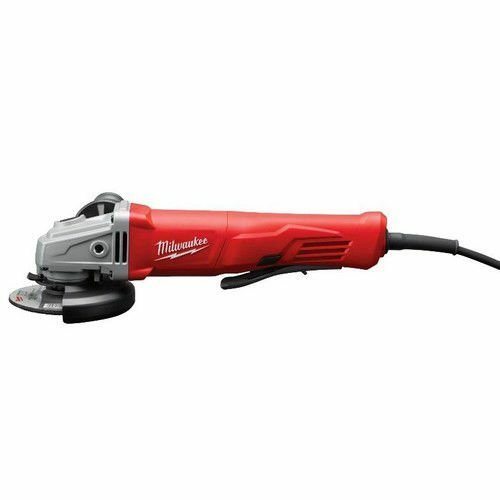 The lightweight Milwaukee Electric Grinder may be the right choice for industrial users. The 1,400 MWO motor is designed to provide 50% more power than similar products. This powerful motor is especially useful in challenging jobs that other angle grinders might struggle to accomplish. However, if you’re only interested in making small, delicate cuts, the motor might prove to be too powerful. Every part of this grinder is completely tool-free, making it easy for you to change the wheels or adjust the position of the guard. Switching out accessories might be a lot easier than other machines on the market. It’s also burst-resistant, a feature that may prevent some possible injuries from damaged wheels and guards. The grip circumference is 2 inches less than most competitors’ products, which can help provide more comfort and less fatigue throughout the day. The Overload protection feature plays a role in maximizing the motor life and increasing the durability of the machine. The no-lock feature and electronic clutch are designed to prevent accidental bind-ups and automatic start-ups. If you find that, after purchasing the angle grinder, the materials contain defects, there’s a 1-year warranty included. The manufacturer will replace your damaged parts. Although each of these grinders has its own advantages, the best grinder is the DeWalt Small Angle Grinder. Unlike its bulky competition, the DeWalt angle grinder is specifically designed for easy portability and versatility. It fits perfectly into tight spaces and doesn’t require special tools to adjust the guard or change the wheel. While it might not contain all the extra features of some options, we love the DeWalt angle grinder because it’s a portable, well-rounded product that is a suitable fit for most projects.